The website Letgo.com boosts: “Make money selling what you don’t need and find great deals nearby.” The service provides an outlet for getting rid of old appliances, furniture and cars. What this service doesn’t refer to is the emotional toll of letting go of family property and possessions freighted with meaning and long-term attachment, like the Longenecker homestead near Rheems, Pennylvania, a house and acreage belonging to our Grandma Fannie Longenecker and then to her daughter, our Aunt Ruthie. On Friday and Saturday, June 23 & 24, 2017 the Longenecker family began the process of letting go of a dearly beloved piece of real estate and its contents. We went through the gamut of emotions mirrored in the faces pictured in a similar scene that occurred exactly 40 years ago also in the month of June in nearby Elizabethtown, PA. 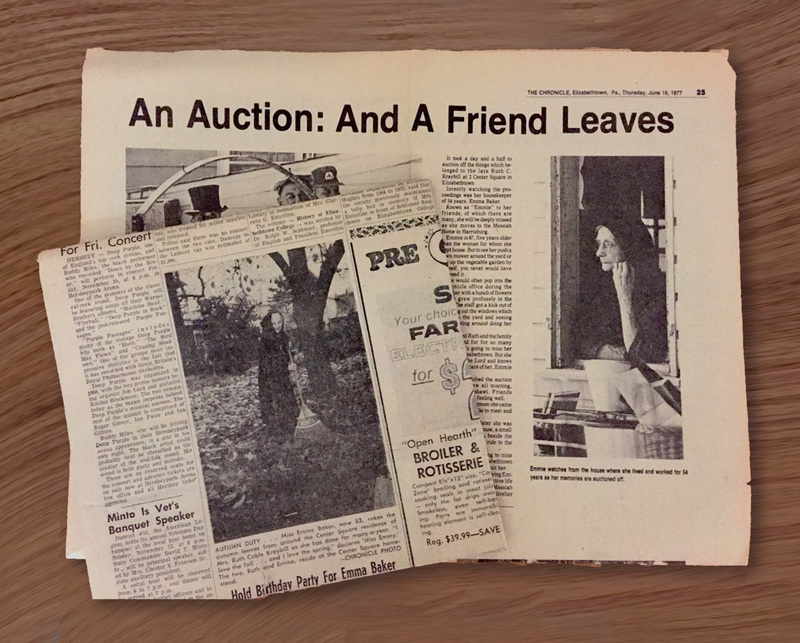 It took a day and a half to auction off the things which belonged to the late Ruth C. Kraybill at 2 Center Square in Elizabethtown. Intently watching the proceeding was her housekeeper of 54 years, Emma Baker, known as “Emmie” to her friends. Emmie is 87, five years older than the woman for whom she kept house. But to see her push a lawn mower around the yard or dig up the vegetable garden by herself, you never would have guessed it. She would often pop into the Chronicle office during the summer with a bunch of flowers, which grew profusely. The staff got a kick out of glancing out the windows, which overlook the yard, and seeing her scooting around doing her work. She loved Ruth and the family she worked for for so many years. She’s going to miss her home in Elizabethtown, but she also loves the Lord and knows He will take care of her, said Emmie. Emmie watched the auction from a window all morning, wrapped in a shawl. Friends said she wasn’t feeling well. But in the afternoon she came outside for a while to meet and talk with people. A couple of days later she was alone in the bare house, a small pile of belongings beside the door, waiting for a ride to the Messiah Home. She said she’s going to miss her friends in Elizabethtown and hopes they will visit her. And her friends, knowing Emmie’s energy and the active life she’s led, think the Home will be quite a bit livelier now. 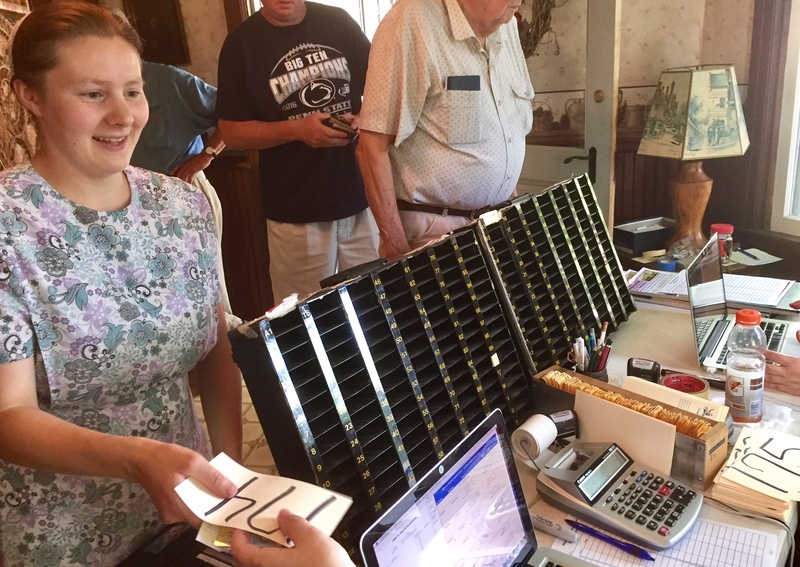 Our ancestors, the Horsts, Martins, and Longeneckers, have had a powerful bond with farmland in Lancaster County which moved them forward, generation after generation. In one sense, we are breaking that bond as we have let go of acreage in Bainbridge, another field on the edge of Rheems, and now the old homestead built in 1912. This past Friday and Saturday the auction process touched us in a deeply personal way. 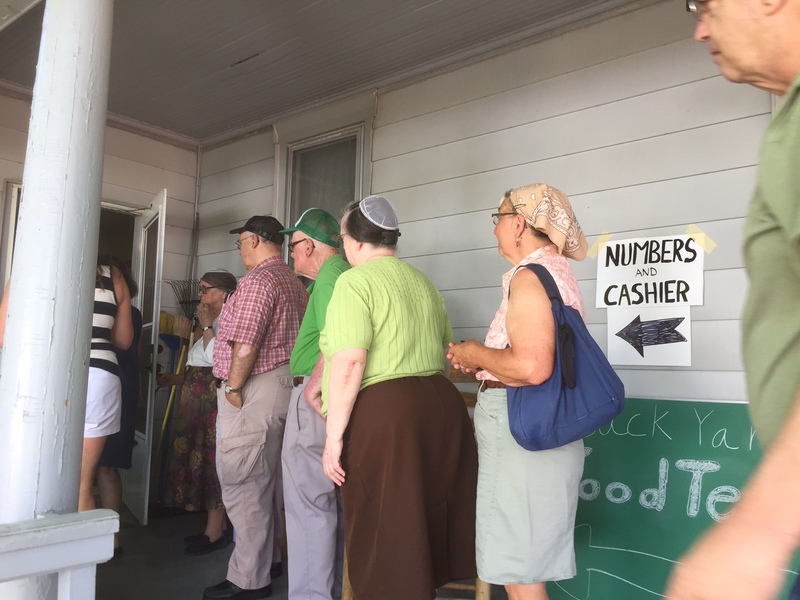 Early both days, people lined up on Aunt Ruthie’s porch to sign up for bidding numbers. 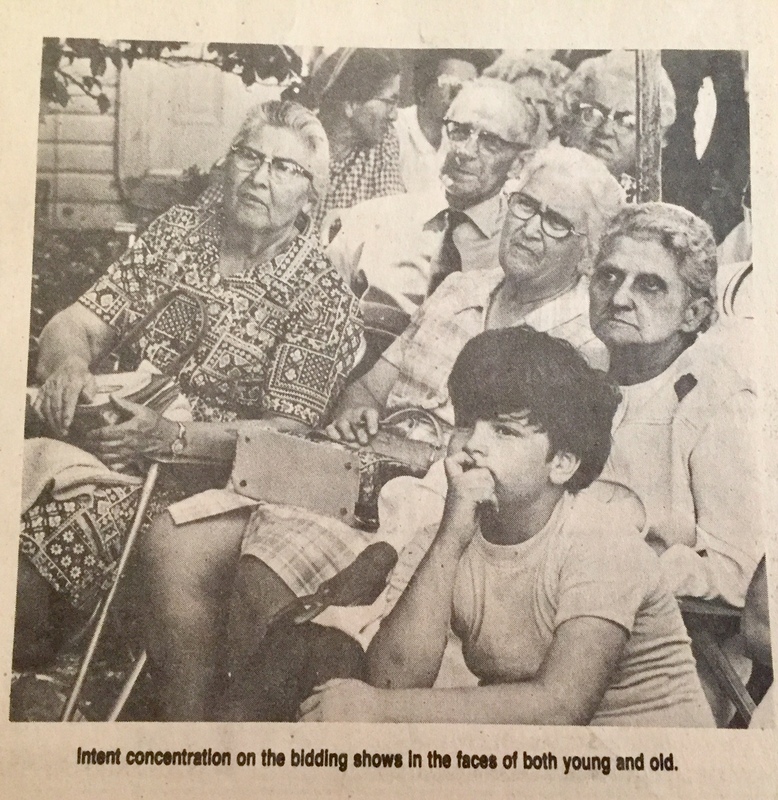 When the auction began, I noticed faces watching the proceedings intently. Head auctioneer Rhonda Siegrist Nissley, a woman my daughter’s age, gestured to bidders boldly and pounded the gavel at point of sale. It was a sale circus, sometimes onlookers circling two auctioneers simultaneously both inside and outside the tent. 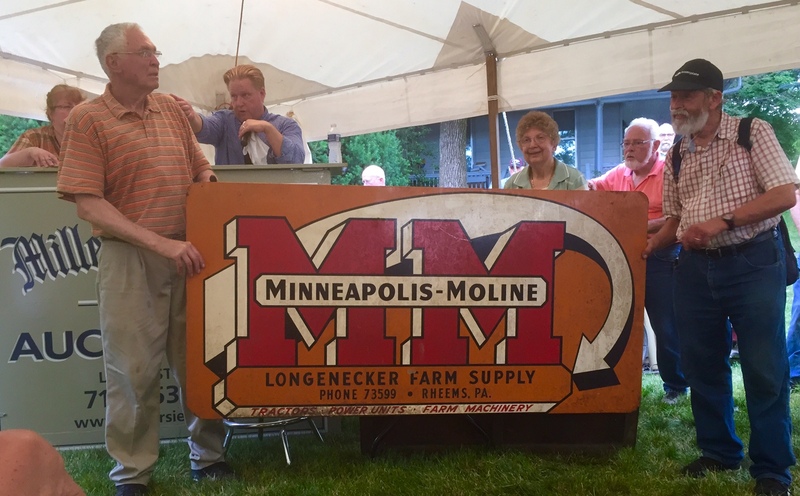 One of the bidders, dairy farmer Glen Longenecker and his wife Sharon, bid on signs like this one and other Longenecker memorabilia to add to a designated area on their farm dubbed The Longenecker Museum. It was a heyday for antique dealers, who hauled treasures to their waiting vans both days. The house, its empty windows looking like sad eyes, moaned a little when its “playmates” left. But not as loudly as we did – at least inwardly. We are still in negotiations to pass on this lovely home to a fine family who will roam the lovely grounds and fill its walls with joy. Is there a childhood home or one you’ve lived in with which you have strong emotional tie? What mementos have you kept? Oh I feel the sad. Yes, for all of you. Very poignant. And I don’t believe I’ve ever watched a female auctioneer! Thanks for sharing that clip. I did read about your childhood farm sale. When I clicked on the link I noticed I was the first to comment. I have to say your words feel more poignant to me now. 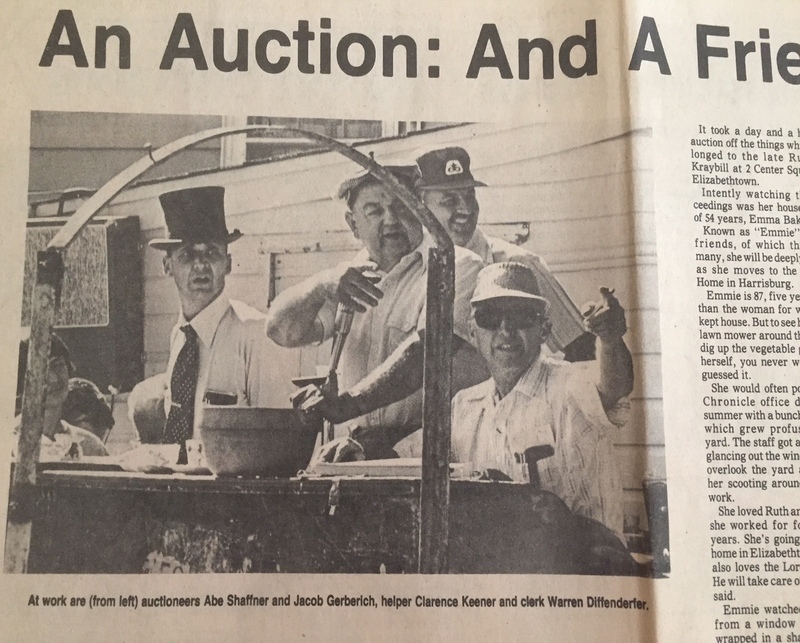 The lead auctioneer was a woman. Her attention to detail was a definite plus from start to finish. Our huge sale required three auctioneers, the others men. 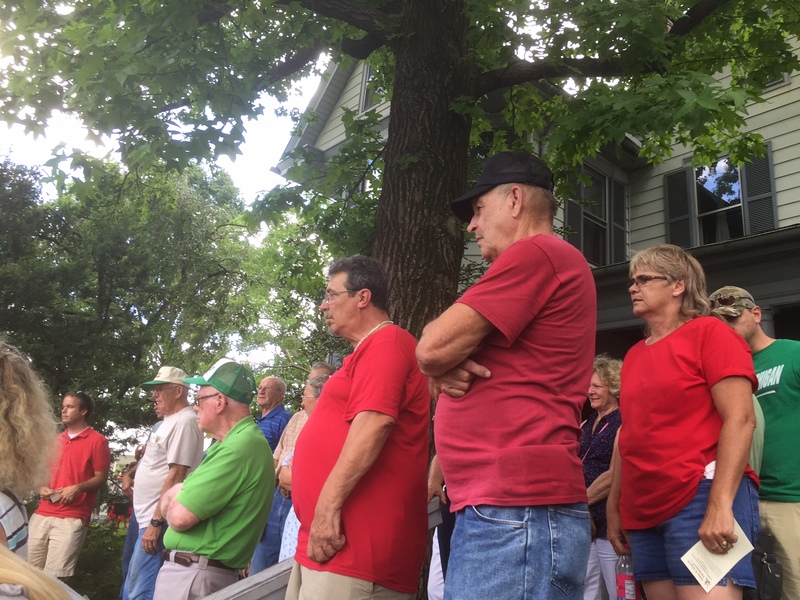 Sometimes auctioneers, two at a time, were handling sales at other areas of the property. I can’t imagine what this must have been like for you and your family–or for Emmie. (Did you know her?) Bittersweet. The house I’ve lived in the longest is the one I’m in now. We bought it when I was pregnant with our older daughter, so it is definitely their childhood home. My house is filled with mementoes 🙂 . Our piano and the “breakfront” in the dining room are objects that were in my childhood homes that now live in ours. The inherited piano and breakfront represent happy times in your family living: music and eating, very well represented in your Monday Morning Musings. I cried when I read this. It is always sad to let go of a family home filled with memories. If those walls could talk! I am sure everything went to good homes and will give pleasure to another set of families, including the house and grounds. 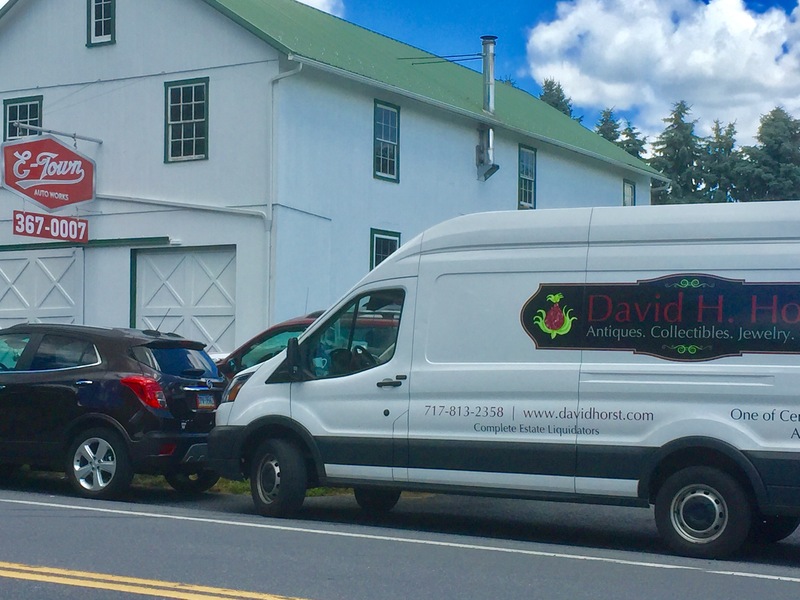 WAs the sign for The Longnecker Farm Supply from your father´s business? It was sad when dad sold the farm/ranch and auctioned off his things. Non of us were interested in farming so it had to go. The amazing thing is that my granddaughter has just bought a boarding kennel to run as a business and it is very near our farm. The circle of life continues. Sending many hugs. Thank you for sending empathy across the miles, continents in this case. Yes, the signs from the Longenecker Farm Supply belonged to my father and his father, Henry Risser Longenecker before him. It sounds like many items will be staying within the Mennonite community, some purchased by friends and neighbors. Your Aunt Ruthie would have loved that. My grandparents had a 1920s era bungalow in GA that was bulldozed to gain access to a modern post office. Around the corner was their family home, a wonderful large Victorian on the historic register, built by my great-great grandfather. It had a a winding staircase leading to mysterious alcoves ideal for grandchildren to explore. Today it serves as headquarters for a real estate agency. I often visit that old Victorian in my dreams. Yes, we take comfort in the fact that many of the items will find residence in other Longenecker homes. I feel sad reading about your grandparents” charming bungalow that was bulldozed. Having our homeplace razed would feel like a disaster to us, but the land has an industrial zoning, so it could be a distinct possibility. Our prayer is for a family that sees the potential and can continue the heritage in their own way. I can’t imagine a wrecking ball at all . . . ! I can’t imagine the regret with which you parted with so much, I’m sorry. But the memories those objects engendered lie within you and not within the objects so you can imagine them any time you want. Yers, memories never die. The best possible way for them to flourish is to see them continued as a restored famiy residence. I’d love to drive by and hear happy whoops and hollers from the woods with children at play. I appreciate the good wishes, Sir David. Hugs too! Hi Marian – this will no doubt take more time to digest it all. No small feat. The photographs are lovely and will always be a reminder, along with all that you have retained. Emmie must be long gone now; her picture tells a 1000 words. 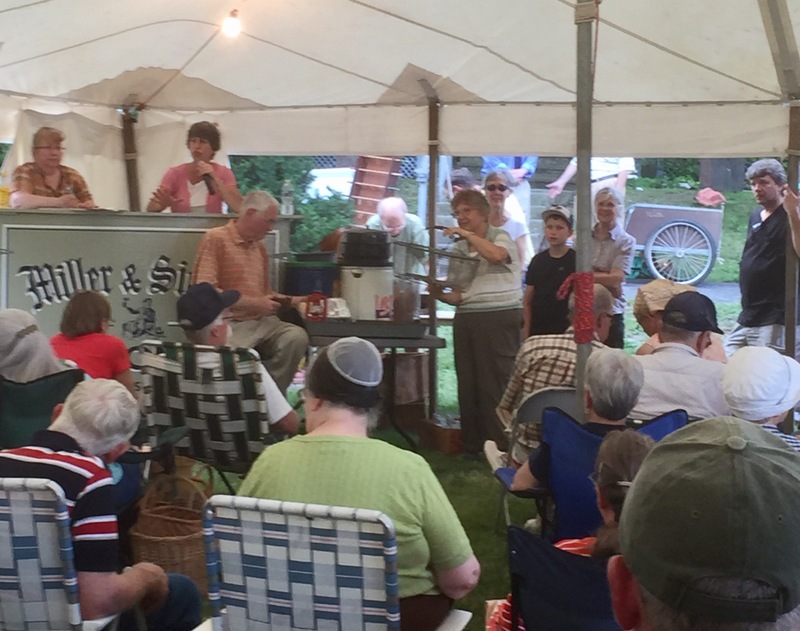 The members of the community were clearly intrigued, and I’m pleased to see that the dairy farmer dairy farmer Glen Longenecker and his wife Sharon, bid on items to add to their farm. Some family is sure to be delighted to be living in this glorious home. It makes a difference to know that a loving family will live there. Good luck on this – trust that the right family will come along. Home is where the heart is, your comment seems to say. I will hold on to your good wishes for just the right family to build a legacy. Thank you, Susan. Such an emotional season for you and your family, Marian. We appreciate you taking the time to share this beautiful post. My childhood home is in Virginia. Once I moved out of state, it was a little easier to break the ties. Thank you for joining others in detecting how emotionally-charged this clearing house & selling has been. I do appreciate your prayers, Jill. Thank you! Back in Florida now, I have some distance from the scene; besides my writing chair beckons. Still . . .
As usual, your post caused me to think…think about all the houses I’ve lived in or frequented in my youth. My grandparents’ home immediately came to mind. Sadly, their home on Maple St. in Pasadena, California was sold to the state when I was in my 20s. A freeway took its place a couple years later, and as recently as last week I drove off the Maple St. exit of this same freeway to take my own grandchildren to a beautiful public garden where I played as a child. Memories flooded my thoughts as I told my grandkids about the happy times I’d spent there. It’s true. No one can take away the precious memories that a special home gifts to us…. One benefit of blogging is reading comments that open my mind to others’ experiences. You must have grieved the destruction of that special house on Maple Street in Pasadena. Oh, my, Kas! Thank you, Marian, for sharing both glad and sad, though I think sad has a bit of an upper hand in this post. I feel your pain. Perhaps the best hope for glad is in the family you imagine on the porch and on the path, filling the house with life once again. I could imagine and even feel the reality of the auction from my own experience. My memoir BLUSH makes The Home Place a character in the story, so I know what you are going through! I know you do, Shirley. Your home felt like a living character when I read BLUSH and does more so quite recently. As it happens, my cousin Ruth Ann chauffeured us from her home in Lititz to visit her sister down the road. On the way there, we passed Forgotten Seasons. Lovely and fraught with so many special memories. So Sad. 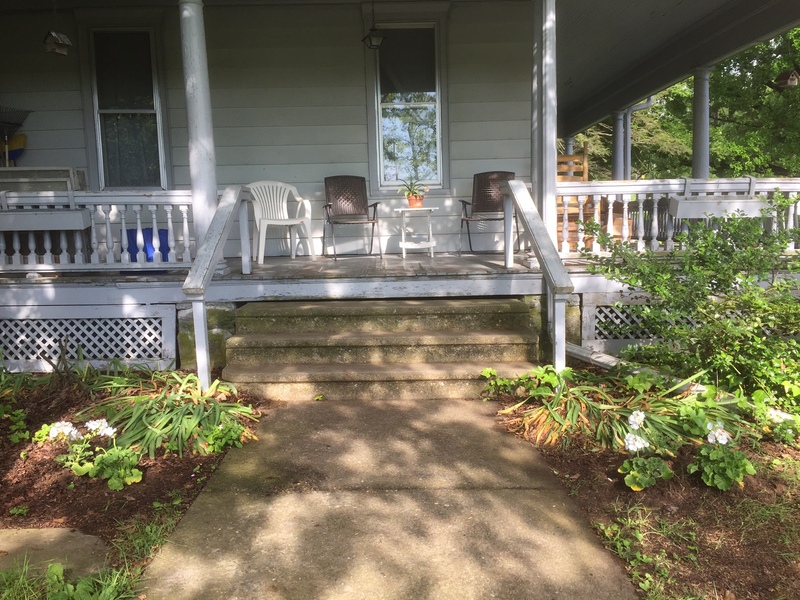 May new generations of family who bond with the land and community find their ways to Aunt Ruthie’s porch. Blessings on your lettings go. Yes, indeed! The porch is a wrap-around verandah, the best perch for us to hear songbirds and see wrens from the teeny house above the porch rail. The woods are not far off, and the Amtrak clatters by, recalling the sounds of the PRR cars transporting passengers between Harrisburg and Philadelphia. So sad, and yet a fact of life. Giving up. Moving on. And then others moving in. The house I lived in the longest was the one in which we raised our children. 17 years. I loved every nook and cranny and view (of the SF Bay) of that house, every crack (from the 1989 earthquake) and glitter stain (on the kitchen cabinets when my daughter’s glitter jar exploded). When we left the house, I talked to it, gave thanks to it, and then had to give it up. I think the house misses me as much as I miss the house. Weird, huh? Oh, Pam, I wonder if you ever written about the cranny crack and glitter festooning the cabinets. If not, you may feel a blog post coming on. Giving up, moving on, a fact of life. It’s happen for me too, but I’m not putting a time limit on it right now. Thanks! 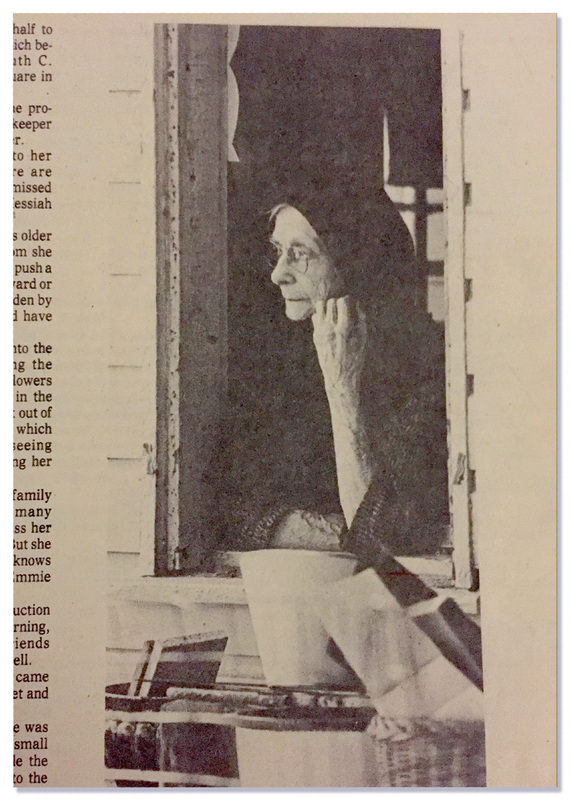 Marian — The newspaper article about Emmie (and photo of her watching from the house) simply broke my heart. And I can only begin to imagine the roller-coaster of emotions you must have experienced this past Friday and Saturday. 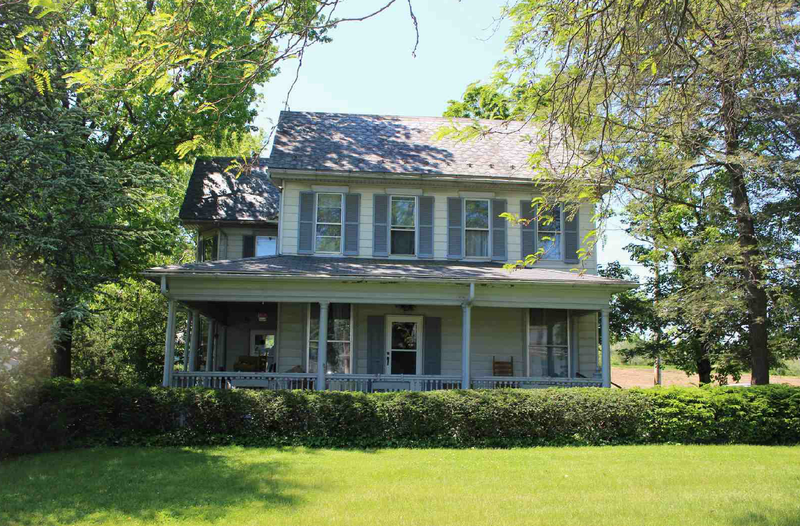 Is there a childhood home or one you’ve lived in with which you have strong emotional tie? Our little home at 1125 Goldenrod Street in Escondido, California holds strong memories for me because of the wonderful group of friends (that I’m still in contact with) that my sister and I cultivated. What mementos have you kept? A multitude of wonderful memories! The sale was a circus indeed. There were tents, one for the auctioning and a food tent sponsored by the Bossler Mennonite Church youth group. And, you are right, our emotions have been a roller-coaster. You know how to cultivate friendships and keep them. Some of my friends date back to first grade as well. Home, Sweet Home! Nostalgic words, but so true! Your Aunt Ruthie’s home looks beautiful and someone else’s family will love it as much as you did. It appears that your parents’ home has stayed in the family, a good thing. That is what we were hoping for, but the next generation is geographically far-flung. Besides, considerable money would have to be invested for restoration. You have so many stories, Elfrieda. I picture a blog post (or a memoir chapter) entitled My Search for Home. Thanks for chiming in here. Emmie’s story is heartbreaking as I guess yours is too, in many ways. The loss of cherished family members and so many things that made you feel at home and safe. My blessings to all of you in a time of emotional transition. In 3 1/2 lines you have summed up my sentiments precisely. I’m now back home. No music, no TV, no noise of any kind. Just silence. I long to get back to the rhythms of home, but it will take some time, just like you wrote about in your own blog this week. I feel the empathy across the miles. Thank you, Joan. Your words are a balm to my soul. Thank you for sending comfort all the way from Thailand, Carol. What a bittersweet story Marian. And such memorabilia. I hope you kept some for yourself besides the personal keepsakes. PS your ‘like’ and share buttons have disappeared? Yes, I have kept a gold-rimmed Austrian serving dish (very ornate), a crystal pitcher, her crewel hand-stitched poem set in a lovely frame 21″ x 25″ and all her diaries. Photos, photos, photos too! If I built a house from the ground up, I’d mourn too. Knowing you, it was custom-made down to every detail. “I thought my heart would snap in two . . ” is very relatable. Thank you for sharing. What a tough time – so many emotions in the letting go. You have that right, Fiona. I have a sense you have experienced the “letting go” too. Marian, I felt the heartbreak in Emmie’s and your stories. The family home we cleared out last year when my mother went into Assisted Living only goes back 58 years, not generations, but held so many precious memories. Letting go of it was excruciating, bittersweet. The day I said goodbye , I walked room to room, sobbing, as if I was grieving a beloved family member. But mixed with that deep sense of loss was an overwhelming sense of gratitude for all the happy memories the home provided. You honor the legacy of your family home and connect me to my own story of this predictable cycle of life that will always be a part of who we are. Blessings and hugs dear Marian as you move forward. Thank you for sharing. I don’t think I’ve used the word “excruciating” these past few months, but that word encapsulates so much of the experience. Yes, I do remember your sorting, recycling, and keeping items when your mother went into assisted living. Houses are indeed characters in our family story, and each room holds scents and sounds of shared joys and sorrows. I’ll gladly accept the blessings and hugs, Kathy. Thank you! It’s so hard to relinquish the past – thank goodness we know that she is in a perfect home now and happy to be rid of her earthly ties. Still, I understand the heartache in letting go of treasures because it feels like letting go of your loved one again. My grandmother assumed care of my parents’ first home, moving into it when country life became difficult. She lived in it for over 20 years (sleeping in my old room). My aunt wanted to buy it but government tape made it impossible. Six months after it sold, it went on the market again. Now my aunt lives in it – renovating madly…and sleeping in my old room. It means when I tell stories I can point out exactly where it happened, and it makes the stories more memorable for my boys. Loss and gain – all part of life. The sooner we learn this the better, I guess. Thank you for sharing the entwined history of a family home. Maybe you feel a blog post ( or short story) coming on. 🙂 All in good time . . . Your post is filled with so much. First, I had quite a shock in looking at the news photo from 1977. I thought for a moment that the woman in the lively print dress sitting in the front row was my grandmother. Then I realized the years didn’t work. Anyway, it’s an uncanny likeness of her. You asked about homes we’d left behind, let go of. I think of my last home in Hudson Ohio, where I raised my children. We built that house, designed it, decorated it, furnished it over the years. It was a home and a property that I felt deeply connected to. (I do that with places, I’ve discovered). And years later, settled happily in Philadelphia, it still weighed on me. Finally, we had a buyer and I wrote her a letter about the house. What secrets we had built into the walls so that we might expand more easily some day (but never did; she’d never know they were there); where the dogs were buried, that sort of thing. I asked her to keep the letter, add to it when she was ready to move, and pass it on to the next owner. And when I mailed that letter I finally was able to let go. Golly, Janet. For that photo to work your grandmother would had to also have lived in Pennsylvania. Still, a shock! What a thoughtful gesture, writing a letter to a home-owner who succeeds you: therapeutic for you, and informational to the new residents. I remember too you were in the throes of selling the log house in Chincoteague not long ago – about the same time we put our house in Killarney on the market. If walls could talk! Thanks for adding your unique slant to the conversation here, Janet. You may think of that childhood home as one of the characters in your early life. I see we visit similar digital “homes.” I was ready to update my feed on Goodreads and there again I saw your smiling face. Thank you for taking the time to read and comment here, Christy! Heartbreaking, for Emmie and for you and your family. On a lesser scale I well remember the auction of my grandmother’s home–the one her family built for her when she was a young widow with three small children, the one she lived in until her death as an old woman, the same one her unmarried son lived in for his entire life until his death as an old man. I took comfort knowing others would treasure the things they were successful in bidding on. I surely do hope that the next family to grace this beautiful home of your family will treasure and keep it well during their time there. Yes, this scene is re-enacted in many family’s lives, especially during the hot summer months. Like you, I felt pleased when I saw how happy people were hauling their “treasures” to their cars or trucks. I heard the man who got help with hoisting Ruthie’s precious hand-painted chest from the upstairs say, “Now that it’s mine, I don’t want to get a single scratch on it.” It went to a good home, obviously! Thanks too for your good wishes about the house sale, Linda. We’d love for the woods and meadows to echo with the sound of happy voices. Marian, what a beautifully written and poignant post you share with us. So many memories sold, but not the ones you carry in your heart. I’ve never thought about a childhood home (there were several) that was special until you asked. I suppose it would be the home from which both my parents left this life and for a variety of reasons. You see that was the home two of the three kids graduated high school, all three of us married, one of us divorced, and one of us went back to clear the house and sell it. Moving Mama was difficult as she had always asked me not to move her to a nursing home, but when she found out it was in Oregon and near Bob and me, she gave her OK. Like you, we sold many things but no auction. And many memories came home to Oregon. But it’s the memories I find in old photographs and my heart that I cherish the most. My thoughts and prayers go with you as you seek silence, a healing balm like no other. May it calm you and restore you over the coming days. Your words are calming, Sherrey. In the days since the sale I have felt shock, moments of awe, but mostly exhaustion; my sisters and I spent 56 days of the last 5 months on the job at Aunt Ruthie’s house. Yes, I kept a journal – ha! Thank you, Sherrey, for sharing memories of your home. I’m sure we will get glimpses of it in your memoir. Right? I get it, Marion. Not from my childhood, but from now. When my Grandpa Ware died in Missouri when I was nine, the old family house was burned to the ground. I was too young to think about the house. I missed Grandpa but was glad Grandma now lived close to us in town and I could walk to her apartment after school. 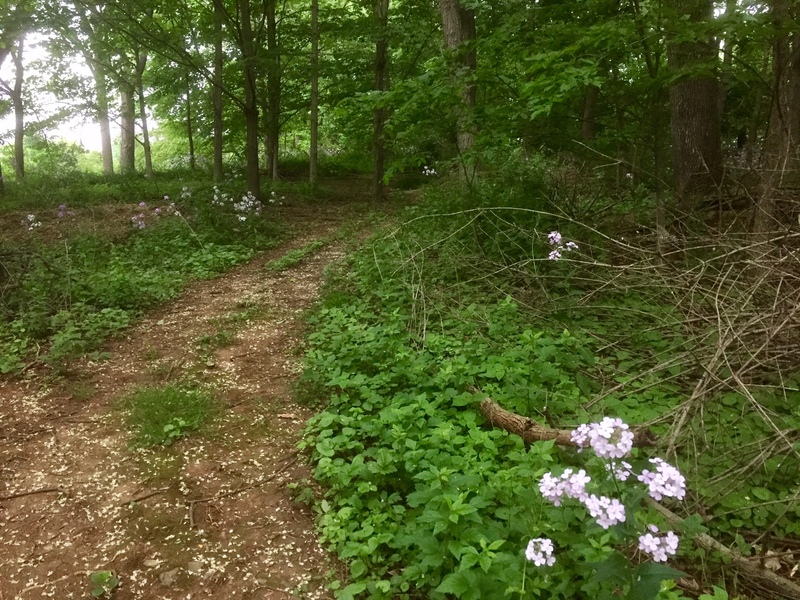 When I returned to Missouri as an adult, only the catalpa trees were still there–set far back from the road through what had been the sheep field, with a no sheep and a new house. I’ve lived in my old farm house since 1972. I realize I’m only a caretaker. It’s all temporary. I tell both my sons we’re only caretakers and someone else will love this house we saved and the woods we cleared of dumps and rusted cars and the trails we cut. They don’t want to let it go and neither do I. We will see how this all unfolds now that one son moved close by. As I write these sentences, I weep. Yes, we’re only passing through this life. Doesn’t mean it doesn’t hurt. Much love to you and your family. You’ve gone through quite an intense time and it’s still not entirely done. Thank you for sharing your wisdom and heart, your history and photos, yourself. You too are going through birth pangs of transition, Elaine. What looks good on paper or worked out in the mind doesn’t always translate to a result the heart can accept. True, as we pass through life we must passed on what has been entrusted to us for a little while. “Doesn’t mean it does hurt” sums up my feelings exactly! I’m glad this post touched a chord with you, and that we can share these deep feelings across the miles. Apparently, both our stories have a to-be-continued tag. Ha!